See Why Saraki’s acquittal cannot stand - Federal Government. 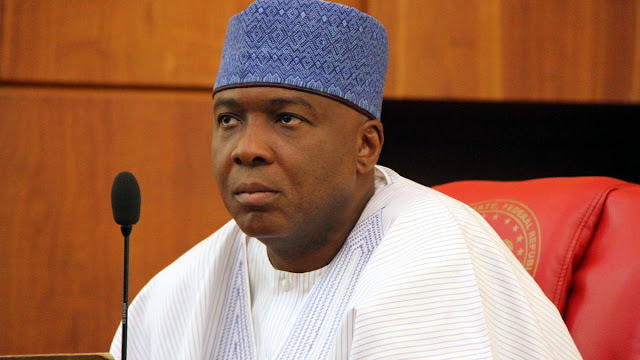 The acquittal granted Senate President, Bukola Saraki, has been argued by The Federal Government in his trial for false assets declaration before the Code of Conduct Tribunal (CCT) cannot stand because the tribunal erred in law in reaching its decision. The FG therefore, urged the Court of Appeal in Abuja to remedy the error committed by the CCT headed by Danladi Umar, by reversing its decision and ordering the continuation of the trial. The FG’s position is contained in a brief of argument filed yesterday at the Court of Appeal, Abuja, for the office of the Attorney General of the Federation by a team of lawyers led by Rotimi Jacobs (SAN). The CCT, in its judgment on June 14, 2017, upheld the no-case submission by Saraki, and acquitted him of the 13 counts of false assets declaration brought against him by the state. In the FG’s brief of argument sighted by The Nation shortly after it was filed yesterday, the FG argued in detail, the 11 grounds contained in the notice of appeal it filed earlier this year. The FG described the CCT judgment as “unconstitutional and without jurisdiction.” It added that the CCT erred in law by upholding Saraki’s no-case submission “when the onus of proof” was on him to show “that there was no infraction in the Code of Conduct Forms. “By the provisions of paragraphs 11 (2), (3) and (13) of Part 1, 5th Schedule to the Constitution of the Federal Republic of Nigeria, 1999 (as amended), once the Code of Conduct form filled by the public officer is investigated and found to be false or that some assets are beyond the legitimate income of the public officer or that the assets were acquired by means of corrupt practices, the public officer concerned is deemed to have breached the Code of Conduct and it is for him to show to the tribunal that there is no infraction in the form. “The honourable tribunal wrongly placed the onus of proof on the prosecution contrary to paragraphs 11 (2), (3) and (13) of Part 1, 5th Schedule to the Constitution of the Federal Republic of Nigeria, 1999 (as amended). “The Constitution of the Federal Republic of Nigeria, 1999 (as amended) clearly excluded the presumption of innocence on the allegation of infraction of the Code of Conduct by public officers and the Tribunal wrongly applied the presumption of innocence contrary to the constitutional requirement. The tribunal’s decision is unconstitutional and without jurisdiction. The tribunal’s decision is against its earlier ruling delivered on March 24, 2016 and the decision of the Court of Appeal in Appeal No: CA/A/172C/2016 where it was decided that the defendant need not to be invited. The tribunal wrongly overruled the decisions of the Court of Appeal and itself,” it said. The FG argued that the CCT erred when it described the testimony of a prosecution witness as hearsay. It said: “PWIII is an investigator with the Code of Conduct Bureau who gave evidence of the role he played, what he saw and the outcome of his investigation. The FG also faulted the decision of the co-member of the CCT, William Agwaza, who held that the joint investigative team, comprising operatives of the EFCC, the Department of State Services and the CCB was unknown to law. It said:”The respondent, by his own application dated 1st March, 2016, had raised the same issue that it is only the Code of Conduct Bureau that could investigate him and that the power of investigation cannot be delegated to the EFCC or any other body or agency. “The tribunal, by its ruling delivered on 24th March, 2016, ruled and dismissed the application of the respondent and he appealed to the Court of Appeal in Appeal No: CA/A/172C/2016. “The Court of Appeal in the judgment delivered 27th October, 2016, by Aboki, PJCA, dismissed the appeal and held that “there is nothing in any law preventing the Code of Conduct Bureau, an agent of the FG, from collaborating or acting in concert with any other organs of the FG, which are also engaged in investigations and prosecution of criminal matters in order to achieve its mandate under the constitution and the law. The FG equally faulted the CCT pronouncement that the prosecution did not tender the original asset declaration forms of the respondent and his statement when they were available. It said: “Exhibits 1 to 6, 26 and 45 qualify as public documents under Section 102 of the Evidence Act, 2011, and there is no law that makes only the original of public documents admissible in law. “The Tribunal failed to consider the provisions of Sections 102, 104, 105 and 146 of the Evidence Act, 2011 to the effect that a certified true copy of a public document or part thereof may be produced in proof of the contents of the public document or a part thereof. “The Tribunal effectively overruled the decisions of the Supreme Court in Odubeko v. Fowler (1993) 7 NWLR (Pt. 308) 637 and the Court of Appeal in Tumo v. Muwana (2000) 12 NWLR (Pt. 681) 370 that courts must presume certified true copies of public document as genuine and act on it unless there is a contrary evidence. “The Tribunal completely closed its eyes to the fact that the prosecution produced the original of the assets declaration forms before the Tribunal and requested the Tribunal and the defendant to compare the original with the certified true copies without any objection from the defendant. “The Code of Conduct Tribunal erred in law in upholding the no-case submission raised by the respondent at the close of prosecution’s case and in discharging the respondent.